It's Oscar season, and whether you're a movie buff or a casual observer, you're going to need snacks. We've assembled a menu of small plates and appetizers that are perfect for a big gathering or a small group. There's red velvet treats to mimic the red carpet, gold for the Oscar itself, and popcorn, because movies aren't the movies without popcorn. Plus lots of other sweet and savory hand-held foods to choose from. Any of the following snacks will make your Academy Awards watching experience more delicious, so pick and choose to make your own ultimate Oscars menu. You can't watch a movie without popcorn, and a show all about movies is no exception. 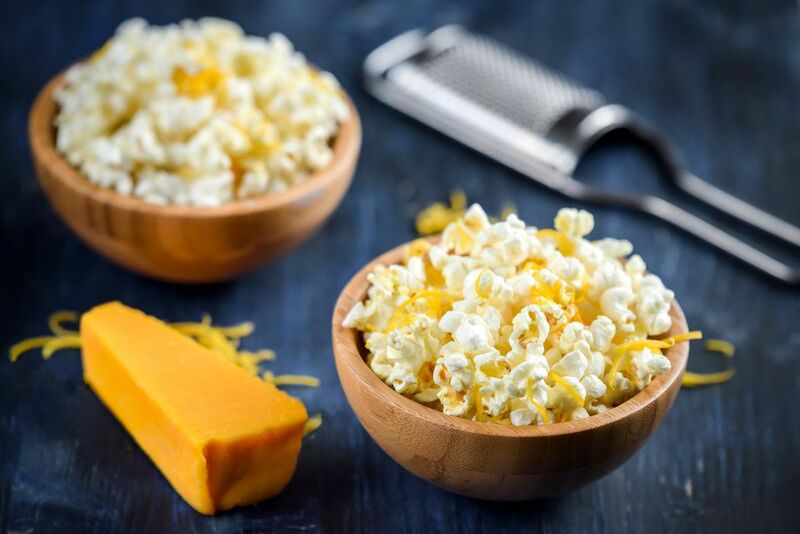 Elevate your plain microwave or stove-popped popcorn by adding butter and real cheddar cheese. Everything's better with butter and cheese, including Oscar night! If you're looking for a stylish savory snack for your Oscars party, then crostinis are always a great option. Topped with ricotta cheese, smoked salmon, herbs, and lemon, these individually-sized appetizers are also quick and easy to make. Raise a champagne toast to Hollywood's biggest night. Or, better yet, make these easy, but red carpet-worthy, truffles and eat your champagne toast instead. White chocolate will be sure to satisfy anyone's sweet tooth, and a gold leaf decoration nods to the Oscar statue himself. For a warm, cheesy centerpiece, simply bake ricotta with olive oil and herbs. Add olives, cured meat, or fruit at the end for a savory or sweet touch. Serve sliced bread or crackers on the side so that everyone can dip into the warm snack. If there was a snack mix category at the Oscars, the award would go to Chex Party Mix every time. Easily assembled with a couple of cereals, pretzels, peanuts, and some household ingredients, it's always a fan favorite. It's also easy to make a big batch in case you're feeding a theater-full. Tacos are always a favorite, but they're too messy to serve at a viewing party (unless you were already planning on getting a new couch). Solution: Mini Taco Bites. The adorable, personally-sized apps will be a box office smash at your Oscar party. For a carb and gluten-free snack, make wafers from a single ingredient: parmesan. They're as simple as grating cheese (you'll want high-quality parm for this recipe) and baking it. Add herbs, cracked black pepper, or garlic powder for a little extra flavor. This make-ahead crab dip is ready in mere minutes, filled with crab meat and a decadent cream cheese and mayo sauce. Serve with carrot and celery sticks, chips, and/or crackers for an appetizer that's worthy of the Oscars. Once the savory snacks have been devoured, roll out the red carpet for a bite of dessert. Red velvet is the ideal sweet to end the evening, especially as moist truffles. They are handheld and no-mess, perfect for a party. The Academy Awards may not be British per say (they have the BAFDAs after all), but everyone can appreciate a great sausage roll. A simple combination of cooked onions, egg, and sausage make a meaty filling for puff pastry. They are quick and filling, and especially good with a bit of mustard. Nothing says classy like a top-notch charcuterie board. Lucky for you, they're super quick to throw together. Start with quality ingredients like a selection of different cheeses and cured meats and add accents like nuts, fruit, and olives. A variety of crackers is a must. Vegetarians and meat-eaters alike will giving a standing ovation for these Parmesan-Stuffed Mushrooms. Behind-the-scenes, this appetizer is actually really simple to make. With just a few ingredients and a minimal amount of time, you'll have elegant bites to serve your guests. Nothing says party quite like a cheese ball, and this classic version has lots of cheesy flavor. Simply combine room temperature cream cheese, cheddar cheese, grated onion, and some spices and roll into a ball. A coating of pecans adds a nutty crunch to this tasty spread. Nights don't get much fancier than the Oscars, so why not pull out all the stops? Everyone loves Oreos, especially when they're dipped in chocolate. 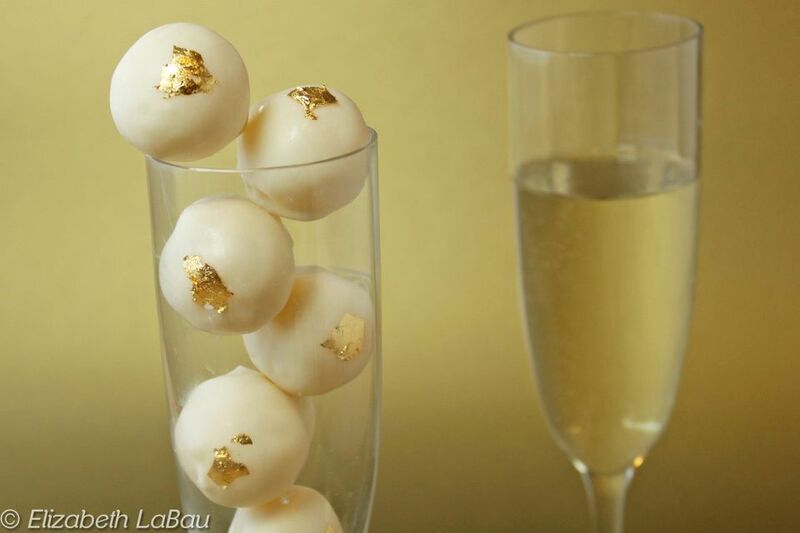 But add a little edible gold leaf or gold luster powder—reflecting the gold of the Oscar statue—and you've got a sweet treat with some star power. For a classic dip that feels a little fancier than salsa or hummus, serve Spinach and Artichoke Dip. Using frozen spinach and artichoke hearts keeps everything easy breezy. Warm and melty, it's delicious served with corn or pita chips, crackers, or toasted bread for dipping. Pizza is always a hit, but it's not exactly Oscar party food. For a simple twist on everyone's favorite, top slices of French bread with your favorite toppings and bake. You have a fun, yet sophisticated appetizer, and you can customize the toppings to suit everyone's dietary needs. Spanakopita, a traditional Greek dish, consists of a flaky layer dough (called phyllo) filled with spinach and cheeses. Individually-sized versions are a tasty, vegetarian appetizer and can be served hot or at room temperature. This recipe uses frozen phyllo cups as a shortcut, avoiding the finicky task of folding the dough. Your Oscar guests might forget who won best picture once they taste these Red Velvet Crispy Treats. A fun dessert that combines the classic rice crispy treat with red velvet cake, it's festive and looks a lot like red carpet. If red carpet was delicious.